If you follow me on Facebook or Twitter, then you know that I have been dealing with a LOT of migraines. I'm working with doctors to try and find out why they have become so bad again so suddenly. In the meantime, I have to manage them and find a way to function despite them. Nausea is one of the things about migraines that I HATE! A couple of years ago, I found out that sucking on a mint will make the nausea subside and will help some with the headache as well. WooHoo! As you can imagine, I was pretty skeptical. What migraine-sufferer wouldn't be? Could something as simple as a peppermint really help provide relief? 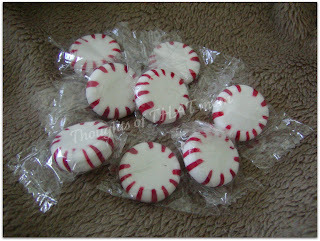 Peppermints help to sooth the upset stomach of THIS father as well. They've improved the quality of mine too, Kim! I'm right with you...I'd MUCH rather try a peppermint (or 5) first before I take even MORE meds! It's too long to post, but I learned a lot about peppermint when Dad was so sick this summer. Someone told me to get peppermint oil, but then I read that if you do, you need to us the capsules that don't dissolve until they're in the intestine. They cause the digestive system to relax and can lead to damage from relux esophagitis. Wow I didn't know that about peppermints and I am a migraine sufferer. I definitely will try it! Have you tried acupuncture? It has really helped me, when I started I was having 2-3 migraines a week. Now thankfully I only have about 1 a month. Okay, I SO should have read this yesterday when I had all the flashing lights in front of my one eye due to a migraine. I usually go blind when I get them, but I haven't had them in a long while. I will get some peppermints in case that happens again! Have you tried magnesium? Seriously...do some internet searching on magnesium/migraines. Also, sometimes certain foods trigger them...which is what happened with me yesterday. I'm not an expert, but I know that those two things (staying away from foods that trigger them for me and making sure I get plenty of magnesium) have helped me. I hope your migraines go away soon; they are NOT fun. I also take a magnesium supplement for my migraines. It helps some...but ultimately...they're still going to come at certain times of the month regardless of how much magnesium I down. I haven't tried acupuncture. I have this thing against volunteering to have multiple sharp things stuck in my skin at the same time. The very thought makes me shiver. I'm glad it's worked for you, though.